Salman Khan wrote on his Instagram, "This is something all of you should know"
In 2015, Salman Khan had tweeted: "Aapke hero ka hero Sylvester Stallone"
Salman Khan's latest Instagram post, a video of his 'hero' Hollywood star Sylvester Stallone, has been breaking the internet. Salman, who is currently busy introducing the Race 3 family, dropped this post and captioned it, "While I introduce the Race3 family this week, this is something all of you should know." 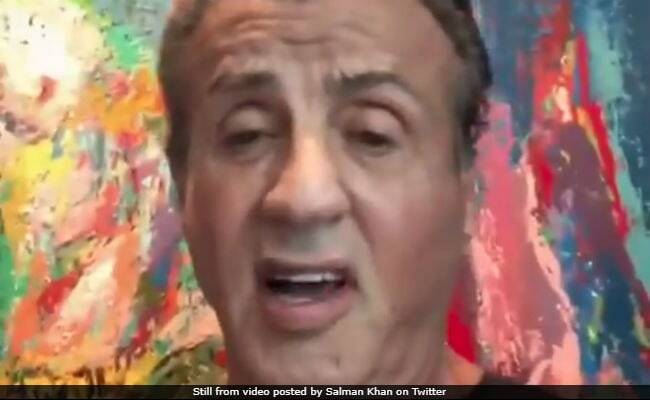 In the video, Sylvester Stallone is seen standing against the backdrop of his own portrait painting as he unveil the details about his forthcoming film Creed 2. Salman Khan's fans on social media are going crazy speculating that the Rambo star might be the surprise element in his upcoming film Race 3. "If Sylvester Stallone is in the Race 3, oh my God it'll be an amazing movie" and "Sylvester and Michael B Jordan...in Race 3..... Please tell me you're not kidding," read two of the several comments posted on Salman Khan's post. Creed 2 is a sequel to the Rambo film series and stars Sylvester Stallone and Michael B Jordan. Creed was released in 2015. While I introduce the #race3 family this week, this is something all of you should know . For those who aren't aware of Salman and Sylvester's history; Salman Khan is a huge Sylvester fan, like all of us. Both the stars mutually admire each other and their 2015's Twitter exchange stands as a proof to it. Back then, Salman Khan had complimented Mr Stallone for his modesty, fitness and directorial skills. The Dabangg star posted back-to-back tweets suggesting that Sylvester Stallone is one Hollywood star, who must be followed on social media and perhaps in real life as well. "Agar kisi ko follow karna hai? Bahar ka... inko follow karo @TheSlyStallone Aapke hero ka hero Sylvester Stallone." His follow up tweet read, "@TheSlyStallone Isse beheter body, director, writer, insaan koi nahi hai. I've always followed him in life but my fault not on social media." The 71-year-old was humbled by Salman Khan's gesture and responded, "Salman, I am very impressed with your many devoted fans. To make a great action film successful takes many great fans who support you, Sly." He even suggested that the two actors must collaborate for an 'action film.' His tweet read, "Would like to thank the super talented Indian superstar Salman Khan, the compliment he tweeted! We should do an action film together!" The Rambo even suggested a project for them. "Maybe the new Expendables," Mr Stallone wrote in his tweet. Race 3 arrives this Eid.